You see, Mirabelle's is located in Fair Oaks near my ex-husband's house. 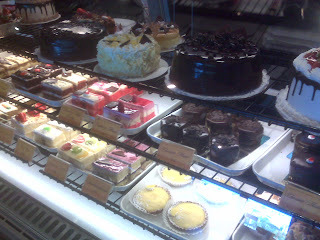 I noticed it over there recently when I saw the sign that said Mirabelle's - A European Pastry Cafe. Alarm sounding! 'Pastry' of course gets my attention but it's value is tripled with the word 'European' in front of it! Deon said that he often gets stuff over there and it is really good. So, it's a second-hand pseudo review. He says they make fantastic crepes and other dishes and have tons of pastries in the pastry case. Well I've never been one able to pass a pastry case, let alone a European pastry case. 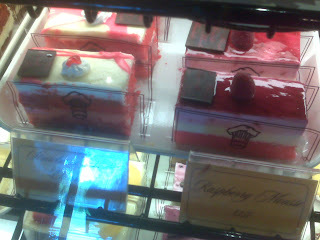 I stopped by to take a look, some pictures, and rate their Napoleon. The place itself is small and attractive with lots of small tables. Outside there are a few tables on a patio with ivy covered trellises. 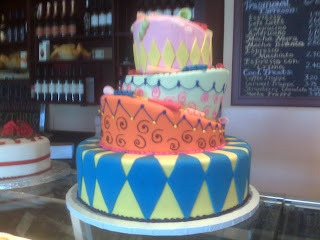 There were quite a number of pastry cases full of goodies and on top were models of some of their wedding cakes. I did grab a menu and, aside from the crepes, they also offer a variety of dishes such as salads, pastas, quiche, soups, and salads. They also have entrees. The prices are a bit on the high side. A savory crepe for $8.75, slice of quiche for $7.95, and grilled salmon entree for $17.75. 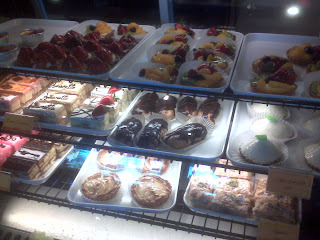 The pastries seem to average about $3.25. You can get a baker's dozen of pastries for $31. So I can't rightly recommend it or not. All I can say is that word of mouth is good (The Bee gave it 4/4 stars) and the selection large. But the prices are high.